Grant’s Zebra (Equus quagga boehemi) is the smallest and most abundant of 6 species of zebra that live in large herds on the African plains. 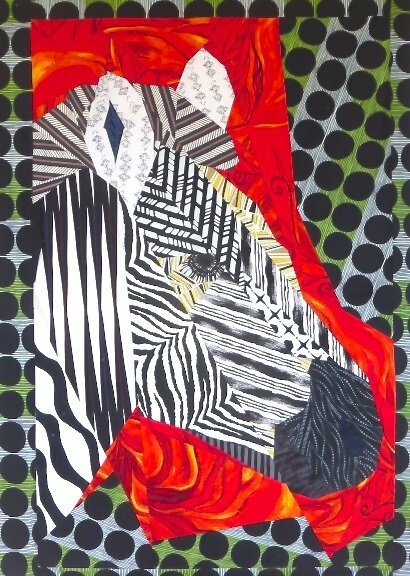 Zebra are fascinating subjects for pieced quilts. The challenge, of course, is all the stripes! How does one convey the bold distinctive black and white patterning without having to piece each individual stripe? In this quilt, I collected a variety of large scale black/white patterned fabrics that have a stripe-like quality, using only a single literal zebra print. The hints of blue, brown and lime green in some of the fabrics add dimension. The zebra’s head is echoed in the bright red background fabric with the large dots adding visual balance and a bit of whimsy. From the Artisan Collection.